Come one come all to the place of places, the mine of mines, the thread of threads. What we've lacked in organized project fodder, we now have. Post your project progress, changes, announcements here in this very thread. It's so easy, drew can do it. My announcement: After months of deliberation I have decided that the hills between Arteggio's Furrytown (uh, what is its new name?) and the under skyranch area needed to come down to ease the transition between the building works there. It's on going, but much progress has been made. Are you flattening the hill like the area under the trap? I see you've already blasted away some of the topsoil. I'll pitch in some help if you like; I've been looking for something to do in Minecraftia. Between wild, new relationships and being out of town a fuckton, I've been slow on progress, though chipping away every time I can do so. I'll be on the road again for the next 10 days, so depending on hotel Internet, I may be on some. 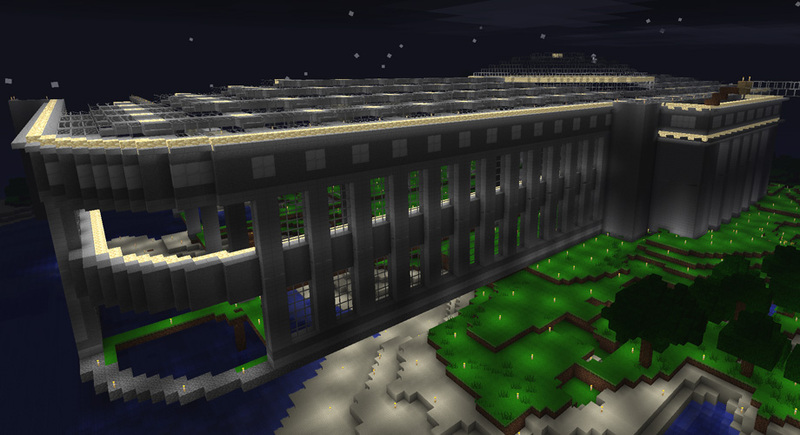 My current project is really terraforming the area around the rink and home base. It's going to be a bear to complete (materials), but I'll be happy once it's done. Last edited by billybobsky : 2011-07-23 at 23:02. Hey guys, be careful around the farm in Bridgeport. Im working on redoing the glass roof so its level with the ground. 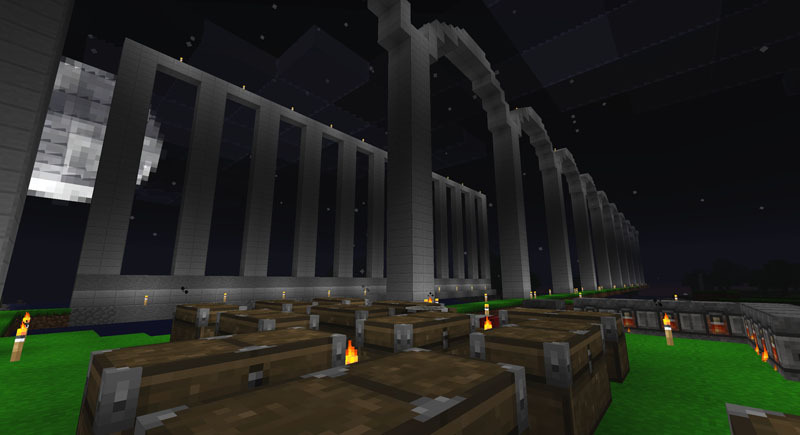 I have it all fenced off and lit up with redstone torches as warning. Might need to add some regular torches in the mix though, I got attacked coming out my front door by a skeleton last night. I dispatched it. The under-ranch area is starting to get a very different feel now that it isn't hemmed-in from all sides... I am dismantling my old trap and integrating it into the plains of the remainder -- working my way towards mushroom mtn... I have yet to decide whether I want to keep the hills under the curved bit on the Southeast side, I suspect I will removed them to make the open air feel entirely consistent (excluding the lead up to mushroom mtn). I'm in bobsky-mode now though with the flattening of land for flooring / fill-resources. I saw this bridge last night!! Kept dying because I wasn't wearing armor. Wasn't sure where to put this, but as I was clearing the land for the East wing I had to chop down some trees.... and let's just say that I love the apples (sticks are handy too, but the apples were a real delight to see). Really? Which tree type was it? I wonder if different tree types drop different items (mine were all oak trees). See? I'm glad SOMEONE appreciates the new custom leaf drops. Gah. I thought it might've been just my bad luck, but there are a lot of spiders in the trees now. wtf? Though I killed one and got my first web earlier. But still. I guess this is as good as any place: There was a dark patch near the stairs to K's new house in BP, enough so that a creeper spawned and took out a column on the Grand Theater. I fixed as well as I could... I suspect there is a bit of Glowstone missing from the column, but nothing else. Been doing a bit today. Laying down more cobble as a floor base for the 1st floor, and hopefully knocking out a couple of more rooms in the basement. So far I'm really liking how this is coming together. Still a long ways to go though. It's good to have neighbors with such high aesthetic standards. I think I may start a separate thread to answer that, since I don't want to clog this thread with months of updates. Plus it'll give me a place to post in the future as this is something that I'll add life to down the road. Well done Brad. Really well done. I love my new neighbor. Given the recent change removing excessive drops, I decided that having a perpetually activated cactus farm was 'unfair' since it tends to have 42 drops constantly in the collection area when the chunks are active. 42/500 is not insignificant. The farm can now be turned on by the flip of a switch which activates pistons to lower blocks that knock off the top of the cacti. Activation isn't nearly as awesome as I was hoping (the sound of 140 cacti dropping isn't as cool as it could be), but if you are are using a laptop and are looking to singe your fingers, flipping the switch appears to spike the processor transiently generating enough heat to make the keys over the processor uncomfortable. Cool. I'll stop by and check it out.